Valid points for sure. Although, to add apple carplay/android auto to the factory unit, they want like $900, which is outrageous. Can't say I disagree with the temperature/volume controls. However, I always use my steering wheel controls, which are compatible with this. It can do a lot more actually: - Download and use any android app - Tethering - Android Auto/ Apple Carplay - Support for additional inputs - Screen customization - Internal storage Those are just a few I saw. Has anyone swapped out their factory head unit for this? https://rhinoradios.com/products/chevrolet-silverado-2016-2018-10-4-vertical-screen-android-radio?variant=19345423204470 I’m thinking about pulling the trigger but interested to hear feedback if any. Do these work for 15 SLE to 16 SLT conversion? I recommend the following: 1. Take off the emblem 2. Use a dremel on the back side of the emblem and pop the letters "GMC" letters out 3. Plasti-Dip the chrome (all of it, that way you don't have any edges that can snag) 4. Use glossifier (If you want a glossy finish) 5. Put the letters back in (I used 3m automotive tape) Take your time, you'll be much happier with the results. Also, I attached my first attempt, which was without popping out the letters. I peeled it off and redid it. I have been through the automatic wash about 10 times now with no issues. 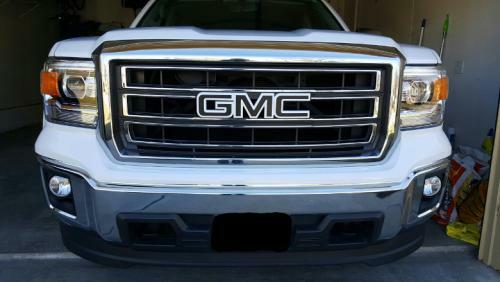 I did this with my chrome on the outside of my "GMC" logo. Only difference is, I wrapped my letters with black carbon fiber. I have a set of Summit White door handles. Asking $175 firm for them. PM me if interested. F/S: 2015 Sierra SLT headlights w/ morimoto HID, Absolutely perfect.